Sooooooo. Because the last day of classes was yesterday (yippee! ), I didn’t have to go to my Thursday night class today. To celebrate I decided to go for a bike ride on my awesome new bike. As I was unlocking it I noticed a woman in the alley behind my building, crouching on the ground. She looked up at me and just then I noticed that she was crouching next to a tiny yellow birdie. Sort-of-long story short, this woman was afraid of the bird and I’m a crazy animal lady, so I agreed to take the bird in while signs go up seeking the owner. Of course, I couldn’t let the lil’ guy stay in a shoebox all night, so as I sort of hemmed and hawed about what to do, Friendly Gardening Neighbor Lady walked by and said her ex-husband had a cage that I could use. 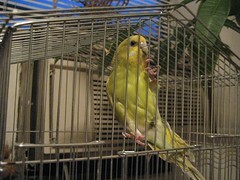 So now I have a bird in a cage in my house. Magellan is vacillating between hysterical startles and nonchalance. The bird is adorable and terrified and currently sleeping under a sheet. I am in danger of gaining a new pet, as I’ve already named him Simon. Wow, this is a great story. Simon? Really? This has too many big words in it for me to understand. Although, it’s Cinco de Mayo party day at work and I’ve had a couple cervecerias which has left me dicha ignorante and chalant at the moment. ohhhhhh that picture gives me the heebie jeebies and i am like 180 miles away! KEEM! I found the bird’s owner! She said that Lemon is old and has never been outside or away from her brother! She’s going to pick her up as soon as she can – either from VCA or wherever VCA sends her. She says thank you thank you thank you.